Attack on the rush has moved from the Offensive Triangle to the Middle Drive and now at the higher levels the Four Chambers. Instead of having a 1-1 on the strong side the offense creates a 2-1 on the widest defender. The player in the middle lane goes hard to the net and the fourth attacker trails high on the weak side. This is one way to practice attacking with the 4 Chambers. A. Players are in two lines facing each other across the neutral zone. B. Stage one: 1 pass across to 2 and pivot in outside chamber for a return pass, skate in and shoot. 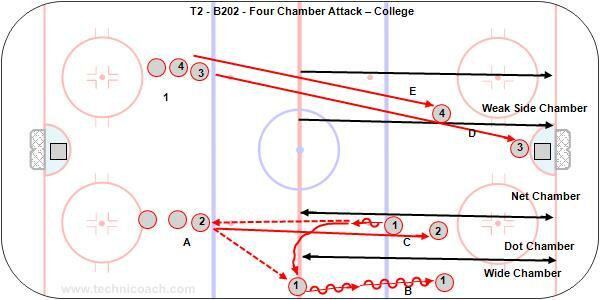 C. Stage two: 1 pass to 2 outside and join attack in the faceoff dot chamber. D. Stage three: 1 pass to 2 and join while 3 from the other line goes hard to the net in the middle chamber. E. Stage four: 1-2-3 repeat while 4 joins as a trailer down the weak side chamber. F. Fifth attacker support from the point. G. Repeat the other way. 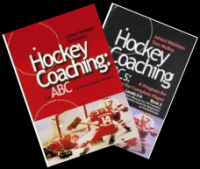 * Players 1-2 attack the widest defender and can cross and drop, 1 skate to the inside and pass to the outside to 2 who crosses and takes the ice behind, 1 chip and 2 chase, etc. Important that 2 skates hard and takes a defender with him. *In the drill this happens at both ends as shown in the video.